Adventures in CSA (week 6): Leek-tastic! When I got the teaser e-mail for this week’s box, I was excited at the prospect of getting leeks. I don’t get potato-leek soup often, but so have the basic components of the same in one veggie box was like handing me one of my favorite meals that I have no reason to avoid making in the first place. So, picture my joy when I opened the box and the teaser was correct – a quartet of luscious leeks, plus a couple pounds of red potatoes…all just calling out “Make us into soup! Make us into soup!” D’okay…if you insist! Looking over the contents and putting them into my tracking spreadsheet, I think this is the first week that I may not get a savings over the grocery store, but we’ll have to see. As I’m looking at price variability, quality may end up becoming more of an issue. 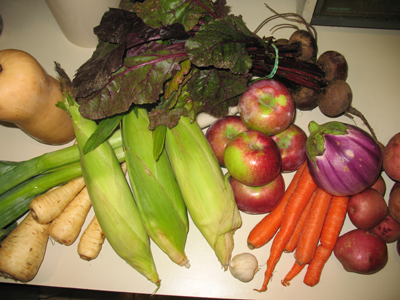 as it is, color me shocked to find that the corn we got in this week’s veggie box was not only good – it was excellent. Unlike the prior weeks, when it was immature, this week’s corn was mature and intensely sweet. I’m not sued to the idea of corn in the fall, and this stuff was light years beyond what you can still get in our grocery store, so I know that – on a quality basis – the $0.60/ear stuff at our store just won’t compare at all. The eggplant still presents a challenge – I just don’t think that I’m ever going to love eggplant. But, I’m willing to give it a shot. I found a recipe that involves doing things to eggplant with an oven and cheese, and if there are two things that I think go great together: it’s an oven and cheese. I’ll report back later on how it all went. This entry was posted in locavore and tagged cooking, crock pot, eat local, fruit, locavore, meal planning, vegan, vegetables, vegetarian by crunchymetromom. Bookmark the permalink.